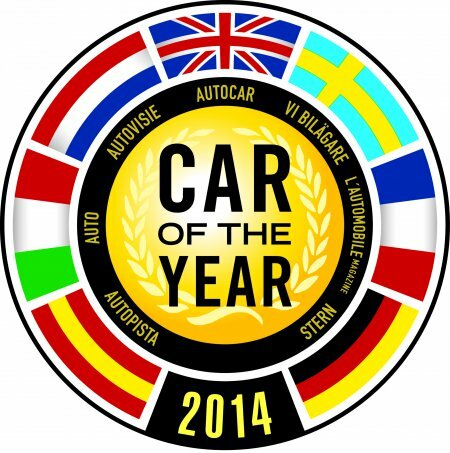 Anyone remember those clever Peugeot ads from the ’80s and ’90s? Well I do; there was the 306 TV ad that used the late, great Marvin Gaye’s ‘Sexual Healing’, and before that, the 205 Look and 405 ads with ABC’s ‘Look of Love’ and Berlin’s ‘Take my breath away’ providing the respective soundtracks. Look them up on YouTube if you want an instant hit of automotive nostalgia, but make sure you watch them all the way to the end; what you’ll find is that long forgotten Peugeot tagline – ‘The Lion goes from strength to strength’. Admittedly, the last decade has made something of a mockery of this – ‘The Lion falls out of the ugly-tree, hitting every branch on the way down’ could have been deemed more appropriate with certain models, that is, until the arrival of the New Peugeot 308. We tested it in THP 156 guise earlier this year and were blown away with the driving experience, the look and the overall feeling of quality that’s been sorely lacking in the marque of late. The 308 is so good, we went as far as to say it was ‘the most attractive car in its class’, and we stand by that still. 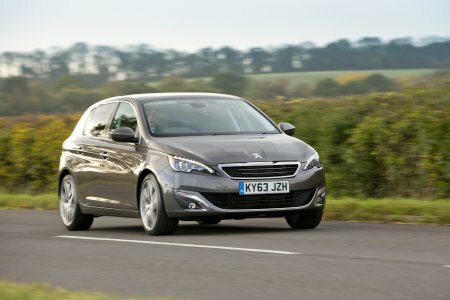 So, what happens when Peugeot invent their own take on the increasingly popular genre of engine – the three-cylinder petrol – and slot it into the already popular 308? Well, in this case, it’s a 1.2l turbocharged affair – the most potent in the Peugeot three-cylinder range that’s been christened ‘PureTech’, generating a healthy 129bhp and 230Nm of torque at just 2750rpm., whilst cutting emissions and fuel consumption by 18% over the 1.6l equivalent. So, the figures sound promising enough, especially with a claimed 58.9mpg combined, but how does this translate to the real world? Pretty well would be the predominant answer. This diminutive engine does a great job of getting what’s a fairly heavy car off the line, and the power band rises steadily, keeping the 308 e-THP accelerating to speeds you wouldn’t warrant a 1.2l possible of achieving. Compared to the equivalent Ford Focus three-cylinder which is powered by an even tinier 1.0l engine, the 308 e-THP hits 62mph 0ver one second sooner. That said, the maximum amount of torque may be at your disposal at 2750rpm, but follow the 308’s optimistic change-up indicator and there’s a definite laboured feeling as you’ll be going through the ‘box a little sooner than you possibly should. 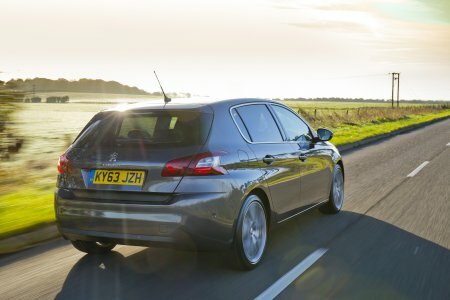 One thing Peugeot have always had a bit of a knack for is handling and feel, and the lightweight PureTech engine really adds to that in the 308 e-THP. The car just seems even more accommodating when you make adjustments from that mini steering wheel, with less metal swinging around in the nose as that weight distribution moves ever-so-slightly rearwards towards the centre. If peace and quiet’s your thing – the 308 e-THP PureTech’s cabin space won’t disappoint. Personally, I like to hear the distinctive thrum that three-cylinder engines emit manifest themselves a touch more when you press on, but the 308’s obviously a little too well insulated for that, and the engine’s hardly audible however you drive. This really is a winning combination of car and engine from Peugeot, then, both of them complimenting the other perfectly. The 308 should be the yardstick that Peugeot measure all future models by, as it really does go ‘From Strength to Strength’. Specifications; Peugeot 308 Feline e-THP 130, Engine – 1.2l three-cylinder petrol, Transmission – 6 spd manual, Layout – Front engine, FWD, Power – 129BHP, Torque – 230Nm @ 2750rpm, Emissions – 110g/km CO2, Economy – 58.9mpg combined, Maximum Speed – 125 mph, Acceleration – 10.3s 0-62mph, Price – £20,995 OTR, £21,520 as tested.